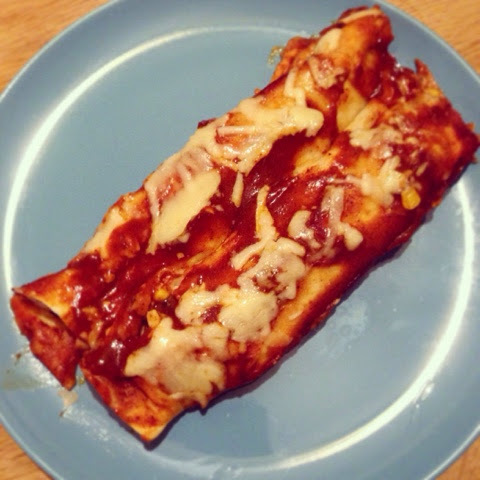 I have made a couple of enchilada recipes from Budget Bytes -- I love her homemade enchilada sauce, and the fillings are always hearty and satisfying. This version might be my favorite one yet. Shredded chicken is combined with black beans and corn, and then the filling mixed into super creamy tomato-cream cheese sauce. Despite the longish list of ingredients, the filling comes together fairly quickly and then gets rolled inside tortillas. The enchialadas are smothered in a homemade enchilada sauce -- it's way better than storebought sauce, and is easy to make with pantry ingredients. Finally, I couldn't resist sprinkling a little cheese on top. The result is gooey, cheesy, slightly spicy enchiladas that are total comfort food. If you have leftovers, they keep well for lunch the next day. 4. Heat a large, non-stick skillet over medium high heat. Add the diced tomatoes, garlic powder, and cumin and bring to a boil. Lower the heat and simmer for about 5 minutes, until the tomato liquid has thickened slightly. Add the cream cheese and stir until it is melted and the mixture is combined. 5. Stir in the chicken, black beans, and corn. Cook for a few minutes, until everything is heated through. 6. Spoon a thin layer of the sauce into the bottom of a 9x13 baking dish. 7. Scoop a heaping 1/3 cup of the chicken mixture into a tortilla and roll it up. Place in the baking dish. Continue rolling the enchiladas until you have used up all your filling (you should get 8 to 10 enchiladas). 8. Pour the rest of the enchilada sauce over the rolled enchiladas and spread it out evenly with a rubber spatula. Sprinkle with the cheese.